The website 4Chan is infamous for birthing Anonymous—and more recently the major alleged iCloud hack that exposed the private photos of several celebrities. But some who frequent 4Chan, it seems, have nobler intentions. 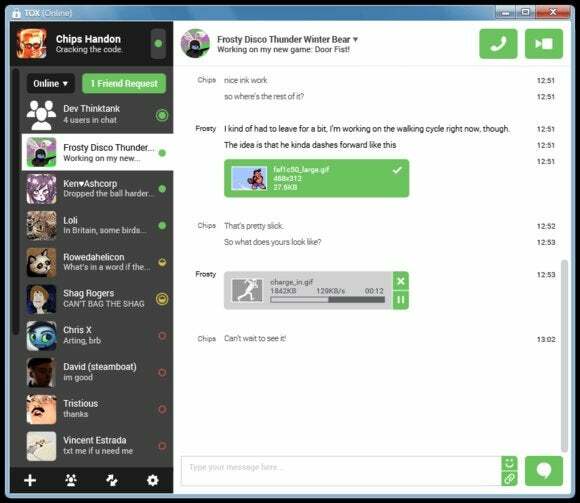 A relatively new project made up of programmers who frequent 4Chan, Hacker News, and Reddit are working on an open source, security-focused Skype replacement, as first reported by Wired on Monday. The new project, called Tox, is yet another example of programmers uniting in the post-Snowden era to make easy-to-use tools with encryption and privacy considerations built-in. It's still too early to recommend Tox as a solid (or even more secure) alternative to Skype as the project is under active development. Nevertheless, Tox is far enough along that there are usable Tox clients you can try out. There isn't an official Tox client right now—although there will be in the future. Instead, thanks to Tox's open source nature, there are multiple Tox apps available. The recommended version for Windows users is called uTox, which you can download as a weekly or nightly build. The developers behind Tox warn that you should expect these early desktop apps to be buggy or lacking operable features. An early build of uTox running on Windows 8.1. Nevertheless, when we took uTox for a spin we found it very easy to use and understand with features such as text chat, the ability to share images and files, make phone calls, and video chats. Since uTox is still in an early alpha phase we won't comment too much on the software other than to say that not all the features worked, but the text chat appeared pretty solid. Tox relies on encrypted peer-to-peer networking to chat with others, eliminating the need for messages to travel through a central server. Skype itself used to be based on p2p networking, but since Microsoft acquired the company, Skype has been moving away from p2p towards centralized servers. After you download uTox, you are automatically assigned a long string of numbers and letters called a Tox ID. To chat with others you simply share that ID with others. Once your friends add your Tox ID to their buddy list you can start chatting. Using Tox IDs instead of a user account allows for greater anonymity. It also means you can start using the app right away without having to sign-up for a new account first—a "configuration-free" experience is one of the aims of the project. You do, however, have to manually add each of your buddies once you've got the software up and running. All chats on uTox are encrypted using the NaCl encryption library, and perfect forward secrecy is used to maintain privacy. But as mentioned earlier, Tox is not yet reliable enough to trust with your deepest secrets, as the code has yet to be audited by security experts. That said, if you like playing with new apps, Tox is worth checking out. 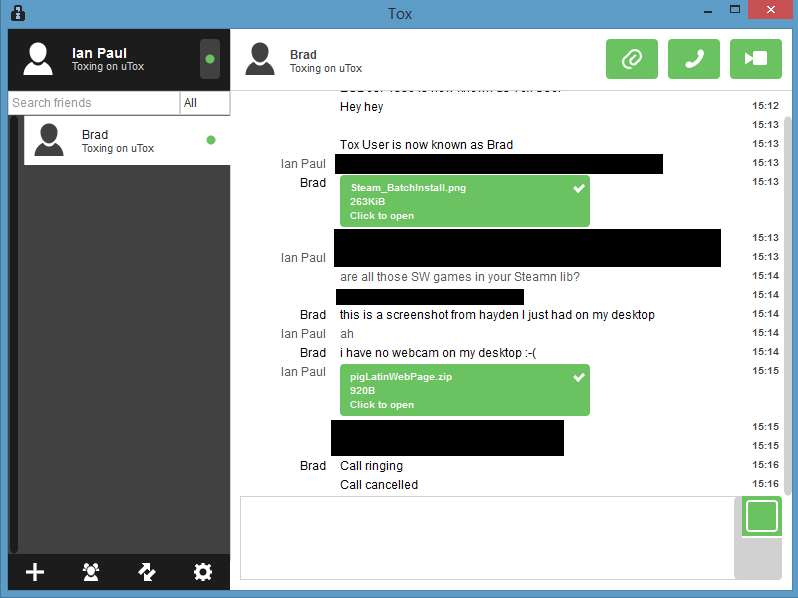 Tox is one of several instant messaging projects that aim to be easy to use while solidly protecting user privacy. Some of the more notable projects include Cryptocat, Invisible.im, and BitTorrent Bleep.